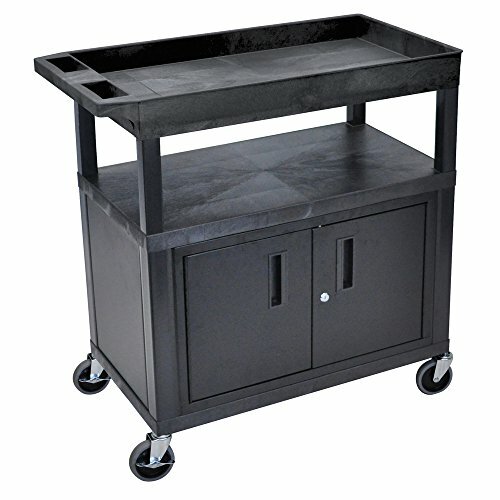 Multipurpose utility cart ideal for use as serving or storage cart and more. Shelves and legs are constructed with an injection molded thermoplastic resin, which will not stain, scratch, dent or rust. Measures 35.25"W x 18"D x 38.75"H (width includes handle) with a clearance between shelves of 10.5" for easy access. Includes one 3.5" deep tub shelf and two 1.625" high flat shelves with 0.25" retaining lip to secure items from sliding off. Locking cabinet with inner dimensions of 31.25"W x 17.25"D x 16.5"H. Ergonomic push handle molded into top shelf. Rolling cart with four 4" full swivel casters, two with locking brake. Maximum weight capacity of 400 lbs (evenly distributed). Assembly required. Color: Black. Lifetime Warranty.